1. 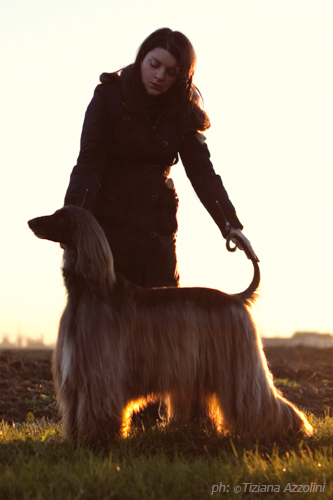 How did your passion for Afghan hounds started and how has it developed through the years? Since I was a child I used to be surrounded by dogs and at the end of the 80’s my family and I decided to take two Afghan hounds from “Settebello” and “Montecchio Val d’Era” Kennels. I remember spending my time with them, and how I enjoyed grooming them and taking them out for a walk. We were completely fascinated by the elegance and boldness of the breed and in 2001 we decided to take three more Afghan hounds from “Gran Pamir” Kennel, dogs that became great life companion for us (when we didn’t use to take part into dog shows yet) and that still nowadays mean a great deal to us. Around the early 2000’s my interest for the breed increased and I began to study it more and more specifically, from the morphology to the grooming techniques where I could seek the advice of Roberto Bongiovanni (Xenos Kennel), whose suggestions I treasured and guided me: this is how my big passion blossomed. 2. 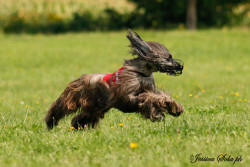 When did you start breeding afghan hounds and in what year did you raise your first litter? In 2006 I helped my brother with a litter which was born at his place, which has allowed me for the first time in my life to get involved into both the raising and breeding of a puppy. Later that year I co-breeded two litters under the guide of my great friend Mrs Cinzia Aymaretti Camia (Gran Pamir Kennel), thus gaining more and more experience with the puppies and the dam. In 2007 I decided to raise my first litter which was followed by a second one in 2009 and, in so doing, I developed my experience as a breeder. 3. On which blood lines have you based your kennel and what characteristics do you pursue most carefully? I have prevalently based my kennel on Swedish blood lines, introducing American and Australian blood lines in my last litter. As far as the characteristics of the breed are concerned, I focus on what I believe to be essential for a sportive hound, which means strong structure yet flexible and agile and powerful muscles: It allows the dog to take the field during the run and to husband its forces. 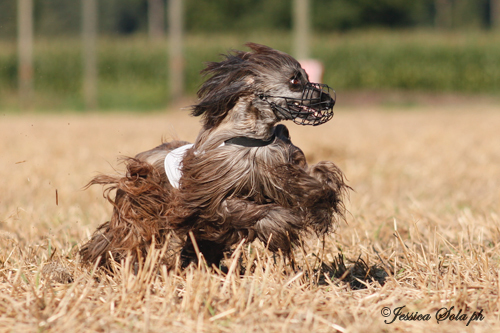 As for the future I aim at fortifying the peculiarities of sportive Afghan hounds, without leaving out the qualities that make them stand out in the ring such as good thrust and leg extension, fluid and coordinated movement and typical expression – harmonious as a whole. These are the priorities of my breeding programme and the criteria through which I evaluate my dogs. 4. How many dogs do you usually have and how is your kennel organized? I live in the country side with my family and our 11 Afghan hounds. Next to the house there is a big stall that we have had renewed and provided with heating. Inside the stall there is a room with camps, beddings and dishes (every dog has its own one). I even leave music and TV “to their disposal”. This room is linked with a paved and fenced-in lodge where the dogs can stay when it rains outside. A little gate lets the dogs go outside, weather permitting. This solution allows the dog to get a constant contact with us and our visitors. In the stall there are two other rooms: we use the first one as grooming room, spacious and full of comforts, so as to let the dogs come in contact with me as much as possible, while the second one can be either a nursery room for the puppies’ very first weeks, or as separated room in case one of the dogs needed extra cares. My Afghan hounds have a plot of land with green grass and trees where they can run and keep fit, which they really love. I know it is a good exercise for them and I like giving my dogs the opportunity to be outside every day. The delivery room is inside my house so that I can check the condition of the dam and puppies during the night: there is enough room for a birth box and a bed for the mum in case she needed a rest. This room has been provided with an access to a little garden where the puppies can do exercise and get used to adults. 5. 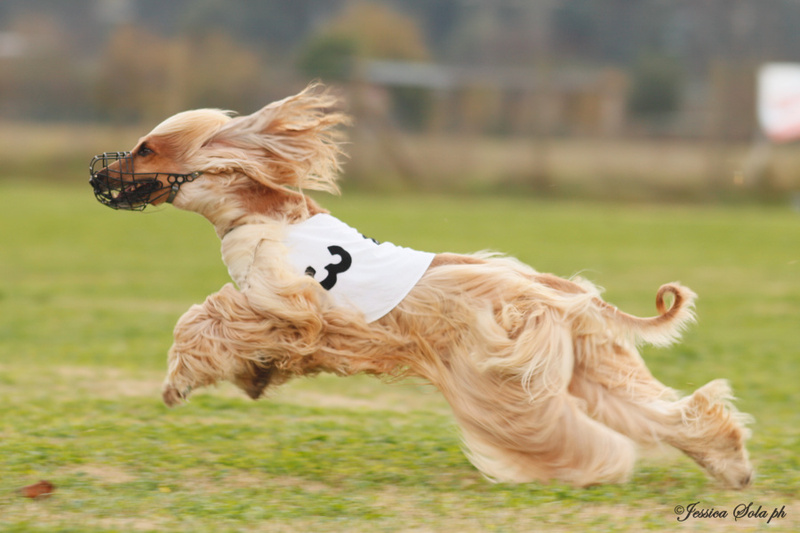 Which successes in dog shows do you most heartily remember? 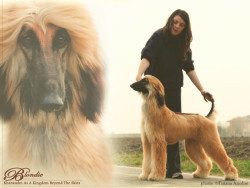 In 2007 little Legolas Extreme became TOP AFGHAN PUPPY and AIALA’s little social champion, in 2008 Estella Extreme and Magical Mystery Tour del Gran Pamir got the title of ENCI’s Junior Champion. However, due to a very bad tail accident, I decided to retire Magical Mystery Tour from exhibitions, despite his great structure. 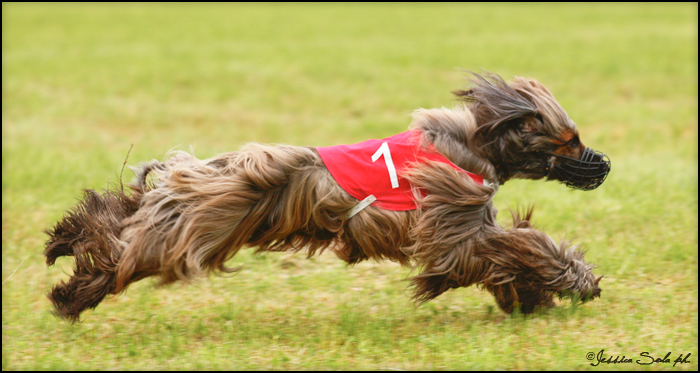 In 2008 I decided to take up coursing. In 2009 Cloudless Rainbow del Gran Pamir and Moonlight Cloud del Gran Pamir became Italian Coursing Champions and BlueWildChildStar del Gran Pamir became National Racing Champion. 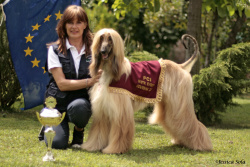 Legolas Extreme’s victory at the European Cursing Championships in Marianske Lazne ( Czech Republic) is my very first record: Legolas is the first Afghan hound, born and raised in Italy, that won this prestigious title. In 2010 Moonlight Cloud del Gran Pamir became San Marino Lure Coursing Champion together with Legolas Extreme, that is Italian Coursing Champion and winner of “Beauty&Performance Title” contest which took place in Padenghe sul Garda during the annual breed-meeting. In August 2010 Estella Extreme got the second place at Swisscombitrophy getting her CAC at the WSVB’s club speciality in Lotzwill. 6. Taken for granted that every single dog is important and unique, which of your dogs has been most influential in your breeding programme? I will name three of my dogs: to begin with, I should never forget European Coursing Champion Legolas Extreme’s parents Siyah o’ Gran Pamir de la Vallèe de la Vezère and Ralan Eylgah de la Vallèe de la Vezère. Legolas’ victory has been really satisfactory for me. Flyingcloud del Gran Pamir is another dog that I am really fund of and that I believe to be important for a future litter. Although she has never been shown, she’s got a great structure, very kind and balanced behaviour and feminine expression. I have got great expectations for her nine puppies. 7. How do you evaluate the development of the breed from a morphological point of view since you first started you career up until now? Since I have got a relatively little experience in this field, I would rather, as a matter of respect, have this question answered by experienced breeders. However, I think that nowadays, it is more the spectacularity of the exhibition rather than the quality of the dogs shown and the breeders’ work that matters. 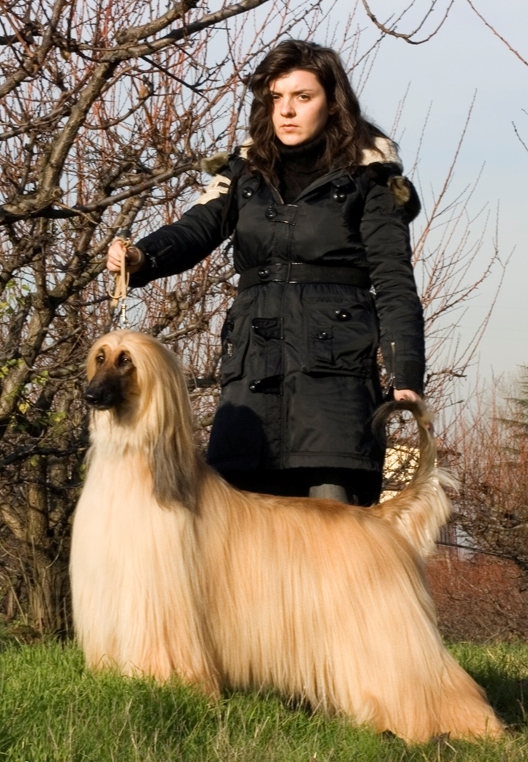 As a result, I fear the Afghan hound might risk being stigmatized as a merely show-off-dog, losing thus its own typicality.